« Oakland builders, what are you thinking? Later the town of Brooklyn formed around the Peraltas’ landing. 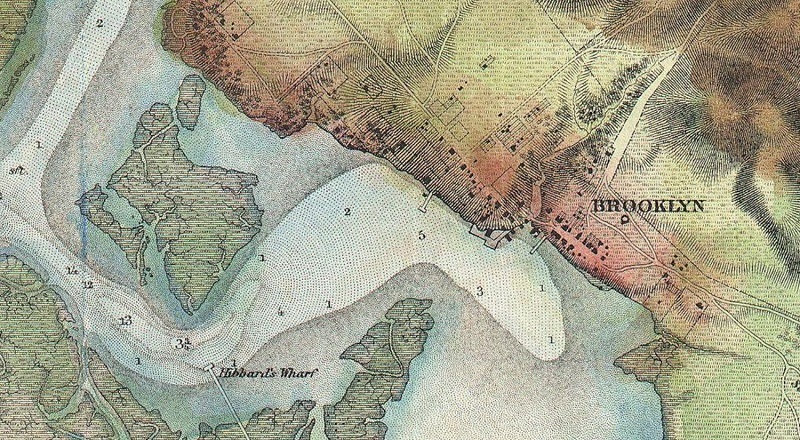 The map below, from 1857, shows San Antonio Creek winding its way west from the Brooklyn landing (thanks Wikipedia). Incidentally this was a true creek, according to long-standing usage in Britain and colonial America — “a small, narrow tidal inlet or estuary” as the AGI Glossary of Geology puts it. Today we use “creek” for any small stream . . . like 14th Avenue Creek (as the watershed people call it), which flowed down to the landing. If this creek had another name, maps don’t record it, and anyway I feel like calling it Brooklyn Creek. The first road, named Commerce Street, ran up along that creek. Today you can drive up it under its new name of 14th Avenue (or ride the odd little 96 line) and still see the valley walls on either side. Long story short, the land was built out and the little harbor disappeared as first the railroads, then the freeway and then BART ran through. The geologic map shows all that as artificial fill (af). This was once the omphalos of East Oakland. 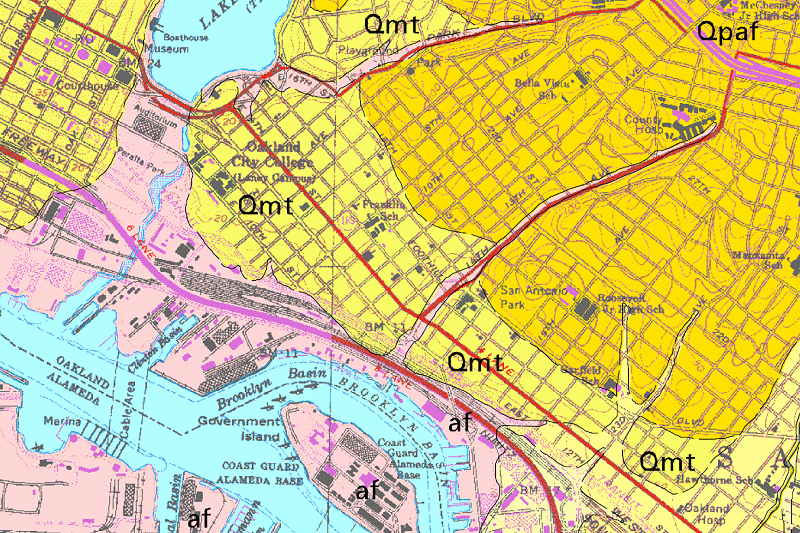 Two different horse-drawn railroads had terminals here, the Oakland, Brooklyn and Fruitvale Railroad and the Brooklyn and Fruitvale Railroad. Today little remains to mark this former place. It was still a destination when the San Francisco and Oakland Railroad sited a heavy-rail station here in 1864, and a single palm tree from the old days grows yet amid today’s anonymous tracks. 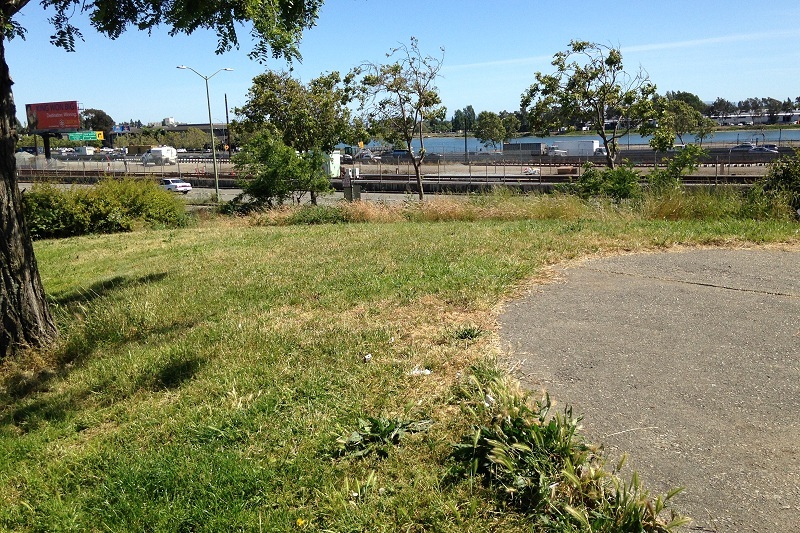 And there’s tiny, seedy Vantage Point Park on the low rise that once overlooked our first harbor. Brooklyn Creek is fully culverted now. Its outlet is probably across the transport corridor at this little cutout along the shoreline. 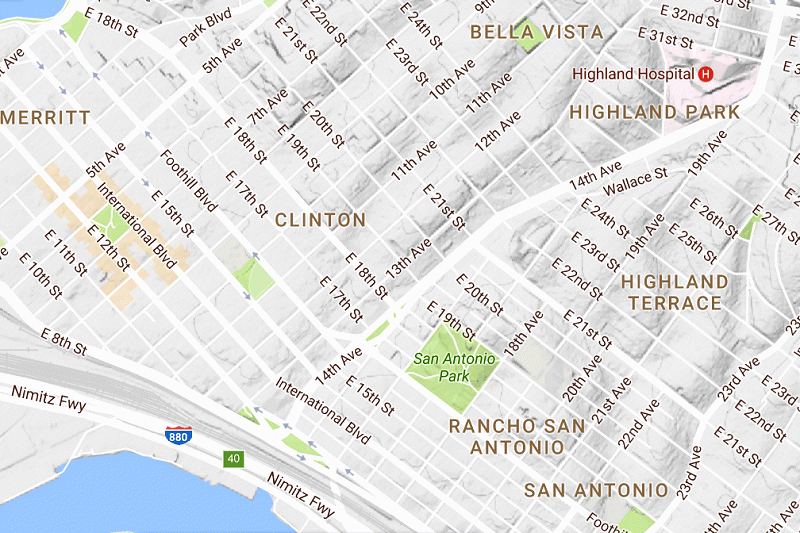 Today San Antonio Creek is no longer even an entity. 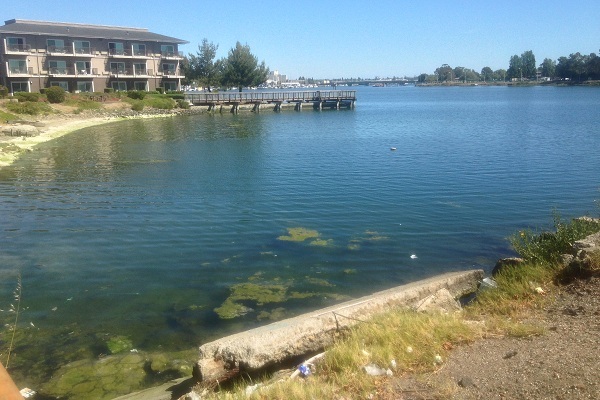 The waterway has been replaced entirely by Oakland’s dredged-out Inner Harbor and Brooklyn Basin. This entry was posted on 19 June 2017 at 8:01 am and is filed under Oakland streams and water. You can follow any responses to this entry through the RSS 2.0 feed. You can skip to the end and leave a response. Pinging is currently not allowed.